Thursday, February 4, 6:00-8:30 p.m. – Verona Road/Beltline Construction “Environmental Justice Community Outreach” Public Meeting (local business oriented), Boys and Girls Club, 4619 Jenewein Road. See article #6. Saturday, February 6, 9 a.m. – DMNA Parks Committee Meeting, 4321 Lilac Lane. Plan solutions to issues in Marlborough and Belmar Park. See article #4. Saturday, February 6, 10 a.m. – DMNA Social Committee Meeting, 4321 Lilac Lane. Plan the Chili Fest and other DMNA social events for the year. See article #5. Monday, February 8 through Friday, February 12, 6:00-7:30 p.m. – Fitchburg Zoning Code Interactive Workshop, Fitchburg Community Center, 5510 Lacy Rd. See articles #7 & #8. Saturday, February 13, 4 p.m. - Dunn’s Marsh Neighborhood meeting with Tom Caputo, Prairie UU Society, 2010 Whenona Drive (corner of Whenona & Crawford). Tom is seeking a liquor license for Bernie & Tony’s Restaurant and Piano Bar at 4265 W. Beltline (the stucco house). Attendees will have a chance to see and respond to a city-approved parking plan for the establishment and talk about other issues: fencing, run-off, security, etc. See article #9. Tuesday, February 16, 7 p.m. - Dunn’s Marsh Neighborhood Association Council Meeting, Prairie UU Society, 2010 Whenona Drive (corner of Whenona & Crawford). Residents welcome, but only Council members vote. Inform DMNA president (above) if you plan to attend. Wednesday, February 17, 5:30 p.m. – Alcohol License Review Committee, Rm. 201, City-County Building, liquor license for 4265 W. Beltline (the stucco house). Same time and date, hearing for a somewhat different application for Faouzi’s Restaurant and Bar at 4245 W. Beltline (old Blarney Stone). See article #9. Thursday, February 18, 6:00-8:30 p.m. – Verona Road/Beltline Construction “Environmental Justice Community Outreach” Public Meeting (local business oriented), Boys and Girls Club, 4619 Jenewein Road. See article #6. Thursday, March 4, 6:00-8:30 p.m. – Verona Road/Beltline Construction “Environmental Justice Community Outreach” Public Meeting (local resident oriented), Boys and Girls Club, 4619 Jenewein Road See article #6. 1 - The Census is Coming. The Census is Coming. 4- DMNA Parks Committee Meeting, Saturday, Feb. 6, 9 a.m.
5 - DMNA Social Committee Meeting, Saturday, Feb. 6, 10 a.m. Recently a friend passed on a rather scary article from the Better Business Bureau focused on what to be cautious about as the 2010 Census gets underway. Although it was directed at helping people protect themselves from identity fraud, the general impression it left me with was that I should be afraid and that I should refuse to answer any questions posed by a census worker except for giving the number of people living at my address. 2. The information is used only by the U.S. Census Bureau, not by other agencies of the government. The information is private and confidential and will not be used to penalize you. Census workers take an oath that the information is confidential, and if they violate it, they could face up to 5 years in prison and a $250,000 fine. 3. For every person counted, the State of Wisconsin gets $1,000 of federal aid. That means $10,000 over 10 years, money to be used for programs and services for people in our state, cities, counties, towns. and neighborhoods. What one needs to be aware of is that some unscrupulous people might possibly try to pose falsely as census workers in order to find out your Social Security, bank account, or credit card numbers. Anyone asking for that information is NOT a census worker. Census workers also NEVER solicit donations. Any one asking for your Social Security, bank account, or credit card information or money is NOT with the Census Bureau. Of course you should NEVER give those numbers to anyone who comes to your door or anyone who calls you out of the blue on your phone or sends you an e-mail. All this said, for your further information, the two articles are reprinted below. I have left out the most fear-producing parts of the BBB article since they are not essential to the important message of being cautious about people falsely posing as census workers. I serve on the 2010 Complete Count Census Committe for the City and County. Cautious is fine but FEAR is not okay! IF YOU COMPLETE YOUR MAILED COPY OF THE CENSUS FORM - YOU DO NOT NEED TO WORRY ABOUT SOMEONE COMING TO YOUR DOOR TO COUNT YOU! By completing your form NO ONE will need to come by and count you. So when you receive your mailed copy of the CENSUS SURVEY with only 10 questions. Fill it out RIGHT AWAY and return it. ALSO, Census workers take an oath that the information is confidential, and if they violate it, they could face up to 5 years in prison and a $250,000 fine. So obviously, the federal government is serious about keeping this information private. ALSO, there will be many sites throughout the Dane County area including community and neighborhood locations that will be a place for picking up information and even getting questions answered about the form you receive. GO TO THOSE TRUSTED PLACES. GO TO cityofmadison.com for more information about the 2010 Census. BUT PLEASE DO NOT USE FEAR AS A REASON NOT TO COMPLETE THE CENSUS FORM. NONE OF THE INFORMATION CAN BE USED FOR ANY OTHER AREA OF FEDERAL GOVERNMENT. So your information is private and confidential and WILL NOT BE USED TO PENALIZE YOU. For every person counted that means $1000 dollars will come to the State of Wisconsin. That equals $10,000 dollars over 10 years and that means more money for programs and services due to the Federal Aid that will come to the state from the Federal government due to the Census Count. I AGREE WITH THE ARTICLE BUT LET’S NOT CREATE FEAR. LET’S MAKE SURE WE ARE EDUCATED, INFORMED AND THAT WE ARE COUNTED! BECAUSE IT WILL MAKE A DIFFERENCE FOR YOUR STATE, COUNTY, CITY AND TOWN IF YOU DO! Remember that every person who is living in your household should be counted and that every person counted generates federal money for use for programs in our state. With the U.S. Census process beginning, the Better Business Bureau (BBB) advises people to be cooperative, but cautious, so as not to become a victim of fraud or identity theft. The first phase of the 2010 U.S. Census is underway as workers have begun verifying the addresses of households across the country. Eventually, more than140,000 U.S. Census workers will count every person in the United States and will gather information about every person living at each address including name, age, gender, race, and other relevant data. ** Census workers are currently only knocking on doors to verify address information. Do not give your Social Security number, credit card or banking information to anyone, even if they claim they need it for the U.S. Census. The Census Bureau will not ask for Social Security, bank account, or credit card numbers, nor will employees solicit donations. Any one asking for that information is NOT with the Census Bureau. In addition, the Census Bureau has decided not to work with Acorn on gather census information. No Acorn worker should approach you saying he/she is with the Census Bureau. Eventually, Census workers may contact you by telephone, mail, or in person at home. However, the Census Bureau will not contact you by E-mail, so be on the lookout for Email scams impersonating the Census. To be held on Saturday, February 6th at the home of Sheila Handrick at 4321 Lilac Lane from 9am to 10am. If you want changes to be made to the parks in our neighborhood: Marlborough Park/Belmar Park, then this is the meeting to attend. Currently neighbors are concerned with dogs off leads, doggie poo not being picked up and the over all maintenance and equipment concerns. If you are interested in being more active in helping neighbors come up with solutions to the above issues please contact Sheila via either email sm_hand@yahoo.com or by calling her at 608-663-0691. Let her know if you are able to attend the meeting or are not able to attend but would still like to help out. To be held Saturday, February 6th at the home of Sheila Handrick at 4321 Lilac Lane from 10am to 11am. The social committee is in charge of coordinating the various social activities in the neighborhood including Friday Night Campfire Socials, Annual Rummage Sale, Annual Neighborhood Campfire/Ice Cream Social and the most popular of all the Annual Chili Fest. I’m looking for neighbors to join me to help plan these events. We are always looking for new ideas to host for the neighborhood. If you are interested in being more active in socializing with neighbors on the above events please contact Sheila via either email sm_hand@yahoo.com or by calling her at 608-663-0691. Let her know if you are able to attend the meeting or are not able to attend but would still like to help out. WisDOT welcomes public input for the environmental justice component of the Verona Road study. We are seeking community input regarding the stage 1 study alternatives from the residents and business owners/operators within the local neighborhoods of Allied, Chalet Gardens, Belmar, Crawford, and Marlborough. Residents and businesses will be contacted prior to these meetings. The meetings will take place from 6:00-8:30 p.m. at the Boys and Girls Club, 4619 Jenewein Road, Madison, WI. The meetings listed above are focusing on the local neighborhoods listed, but you are welcome to attend and provide input. Please contact myself, or Larry Barta 246-3884, larry.barta@dot.wi.gov, with further comments or questions. Like your neighborhood? Have some problems with it? Admire another specific neighborhood in the region? Who doesn't?!? implement the vision in its Comprehensive Plan, adopted last year. Those with a strong interest in Fitchburg's future should try to attend all three evening meetings, and are welcome to drop in to discuss the process with our consultants during the open studio times. If you can only attend one meeting, make it the Monday night Opening Workshop. This is a once-in-a-lifetime opportunity, so don't sleep through the revolution! Much more information is available at http://FitchburgZoning.com, which will be updated throughout the week with new sketches, maps, and other material as it is developed. For a three-minute video on some of the principles in the Comprehensive Plan, check out http://www.youtube.com/watch?v=VGJt_YXIoJI. For answers to questions on the process or our current or updated codes, please contact Susan Sloper of the Planning Department, Susan.Sloper@City.Fitchburg.WI.US or 270-4256. This evening will consist of a 30-minute presentation to explain the process and goals of the charrette, along with what a form-based code (FBC) is all about. Afterward, the public will be asked to participate in a visioning workshop to shape the form of future development in Fitchburg. Smaller focus group discussions will occur on Tuesday and Wednesday on a variety of subjects, including Development Community Summit, Chamber & Business Community, Civic Groups, DNR / CAPRC, Utilities, Parks and Open Space, Transportation, Schools, FUDA Landowners, and Farming Community. This evening begins with a quick overview of progress to date, but turns quickly to an open house for community feedback. The design team will be available for Q&A and there will be opportunities for people to leave written critique / comments as well as verbal. This is a very important event as it's an opportunity for the public to critique how well we've listened and to give mid-term adjustment to the process. The final presentation will be a formal Power Point with illustrations, maps and diagrams pinned up around the room for review. After the formal presentation, there will be an open microphone for public comment / critique that will go into developing the revised code & map. This is another opportunity for critique and readjustment as we move into the Public Hearing Draft process. The issue of the bars along the frontage road goes on and on. But as old-timers in the DMNA know, it’s the perseverance of the neighborhood that will pay off on a controversial issue. Remember how it took 4 years(!!!) to get the buffer area along Dunn’s Marsh. If we had given up or given in at the first sign of difficulty, there would be apartments where there are none. A neighborhood meeting with Mr. Tom Caputo is scheduled for 4 p.m. on Saturday, February 13 at Prairie Unitarian Universalist Society. Mr. Caputo is to show a City of Madison approved parking plan for his proposed Bernie and Tony’s piano bar at 4265 W. Beltline at that time. Residents should have a chance to talk to him about other issues as well. A hearing about this bar is scheduled for February 17 before the ALRC (Alcohol License Review Committee). However, as of February 1, the Madison Zoning Division reports that Mr. Caputo has not yet come in with a parking plan that city staff can look at to approve or not approve. In regard to the new application for Faouzi’s Restaurant and Grill, the DMNA Council decided at its January meeting not to take another vote on whether to support this restaurant/bar at 4245 W. Beltline and not to schedule any special meeting with the neighborhood unless some fairly extensive changes were proposed by the applicants. As far as we know, the main change since the last hearing is that Mr. Faouzi is no longer listed on the application, and the new agent who’s listed worked for the Cardinal Bar at one time. The DMNA Council opposed this liquor license at the December meeting. Faouzi’s rather extensive criminal record kept the ALRC from considering granting a license to an establishment with him as a partner or agent. The new agent does have a drug misdemeanor from 2009 on his record, but just one. There will be hearings on both applications – 4265 and 4245 W. Beltline - at the February 17, 2009 ALRC meeting, 5:30 p.m., Room 201, City County Building, Martin Luther King Blvd. But…keep tuned, we’ve found out from experience that this could easily change. Neighbors just slightly outnumbered the “officials” at the DMNA Marsh Protection Committee meeting January 5, a meeting called to learn about Fitchburg’s plans to construct a “wet pond” near the foot of Apache Drive where it meets Crescent Road. Big changes are afoot. Brush and some trees will be cleared from the land, and a pond the length of about 3 house lots will be constructed. 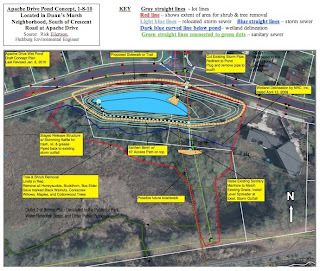 The purpose of the pond is to remove trash and suspended sediment from street water run-off before the water gets to Dunn’s Marsh and then continues down the Nine Springs Creek corridor to Lake Waubesa. Besides learning about the proposal, asking questions, and making suggestions, the committee elected Brooke Norsted as DMNA Marsh Committee Chair. Basically, neighbors were concerned about the drastic change in appearance that will result from preparations for pond construction and about paths related to the project. Marsh committee members expressed the desire to retain as many of the larger trees – cottonwoods – as possible. They also favored making connections from Crescent to the future Cannonball Bike Trail which will be located on the old railroad right of way that passes along Dunn’s Marsh and connects to the City of Madison’s Southwest Trail and the State’s Military Ridge Trail. Committee chair Brooke Norsted’s notes follow, in italics. This wet pond is intended to remove suspended sediment from water that is flowing into Dunn’s Marsh. Currently, water from the storm sewer does not get treated and discharges into the marshy area north of Dunn’s Marsh. Rick distributed an aerial map of the area with the area to be cleared and the wet pond outlined. The property in question is Lots 19 and 20 in the City of Fitchburg, just below Crescent Road. The property transfer is happening shortly. The land easement states the land will be used for stormwater and park purposes only. In order to clear room for the wet pond, there needs to be some clearing of the property. This is scheduled for later in January or February, 2010. Smaller stumps will be painted with aquatic approved herbicide (Rodeo) so they don’t grow back. Neighbors expressed that they would like large trees to not get cut down if possible. Trees will be marked and neighbors will be invited to a walkthrough of the property to talk about which trees will remain. The group discussed the possibility of creating a walking path on the berm that will surround the wet pond. There is money in the grant budget for educational signage that would be accessible from this path. The flanks of the wet pond will be planted with grasses and left free of trees, so the pond is accessible for maintenance (cleaning and dredging). The group also discussed creating a trail for access to the future Cannonball Trail. Rick brought samples of signage from other similar applications to begin the brainstorming process. What trees are going to cut? What trees will remain? Can neighbors have a say in what goes and what stays? Just exactly where will the boundaries of the planned new “wet pond” be on Lots 19 and 20 in the vicinity of Apache Drive and Crescent Road? Anyone and everyone interested in answers to these questions or wanting to put in their two cents’ worth about what happens there will want to make time for a “walk-through” of the area, to be scheduled for the sometime before mid-February. Please contact DMNA Marsh Protection Chair Brooke Norsted to get final information: 271-2155, baswanson@gmail.com. People with questions or comments related to the work were urged to contact Rick at 270-4264 or rick.eilertson@city.fitchburg.wi.us. It’s not the first time, and it may not be the last time that Lots 19 and 20 - those 2 lots just below Crescent Road, at Apache – are in the news. In fact, back in 1975, just 2 years after the founding of the Dunn’s Marsh Neighborhood Association, they generated more than just a passing interest. The proof? They occupy an entire chapter of 17 pages in the neighborhood history book In Our Own Words: The Best of the Dunn’s Marsh News. Those pages detail the successful 4-year struggle to save the two lots from certain development. They also reveal the names of activists from those years and display vintage pictures of people still active in the neighborhood as well as facsimiles of primary documents utilized during the campaign. History buffs, here’s your meat and potatoes. Will these few quotes from the articles that make up Chapter 5 pique your interest? The chapter is called “Securing the Marsh Buffer.” Italics are added to emphasize some of the most relevant concepts. 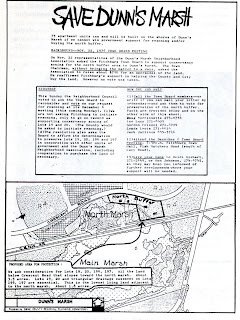 For a glimpse at one of the primary documents used to convince government authorities to preserve the buffer area to Dunn’s Marsh, check out the attachment “3 Save Dunn’s Marsh 1975.” It has a nice map of the area which gives a perspective of the entire marsh complex. The book In Our Own Words: The Best of the Dunn’s Marsh News is available for just $3. It’s crammed full of photos, drawings, and maps as well as articles by and about people who have lived in the neighborhood. Contact Mary Mullen, 298-0843, or mmullen@chorus.net. If you use rock salt or other common de-icers, be sure to follow the instructions and don’t use too much. Adding more than the recommended amount does not make the snow melt any faster. The greenest way to deal with ice is to physically remove as much snow as possible. De-icers are not formulated to melt through ice build-up or compacted snow. The less ice there is, the less salt you will need to use. Apply any ice-melting products at the beginning of a snow or ice storm. This prevents ice from bonding to the pavement and will ensure that less salt is needed. Once the temperature dips below 15° F, salt is unable to penetrate the ice to start the dissolving process. When the air is bitter cold, regular playground sand can be used to increase traction Be sure to clean sand up properly during thaws, however, since it can easily clog drains and sewers. There are many eco-friendlier alternatives to salt available at hardware stores, but some are greener than others. Most include a combination of salt combined with other common materials. A de-icer that includes salt mixed with calcium magnesium acetate (CMA) or potassium acetate (KA) is better than salt by itself. You read about it last month. This is the month to stop procrastinating and just do it. Do what? Sign up to be a GREEN POWER HOUSEHOLD. If you get your electricity bill from Madison Gas and Electric - which all of us in the Dunn’s Marsh Neighborhood do - you can be one of the many who can put us over the top in the contest with 15 other neighborhoods competing for the highest increase in the percentage of households signed up for Green Power. The reward for first place? $1000 smackeroos. Second place would bring $500 to the Dunn’s Marsh Neighborhood Association. If you’re already convinced, go immediately to <https://www.mge.com/my_mge/ServiceForms/WindPowerRes.htm <file://localhost/my_mge/ServiceForms/WindPowerRes.htm> >. At that website you can find out your own average cost and also sign up. If you aren’t convinced but need more information, please read on…. What does it mean to sign up? As mentioned in the January 5, 2010 e-News, Green Power Tomorrow is a sign-up to buy green power – mostly wind power - for your home to offset a portion or all of your electricity-generated carbon dioxide emissions. Customers have 3 choices as they sign up. One choice is to sign up for a fixed 300-kWh block of green power per month. The second choice is to contract for 50% of the monthly electricity usage to be green power. The third choice is to have all 100% of monthly energy use billed at the green power rate. Under this program each kWh of electricity costs 1 ¼ cents more than it would normally cost. The excess goes to support green power (wind and solar power). How expensive is this? For the average household, a 100% sign up would mean an extra $7.50 a month. A 50% sign up would cost $3.75 more per month for the average household. Since the average household uses about 600 Kwh per month, signing up for a 300 Kwh block would also cost $3.75 per month. Since some households use more than 600 Kwh on average, a way to limit the green power payment is to simply sign up for the 300 Kwh block of green power and pay an extra $3.75 per month. Is a few dollars more a month too much to pay for efforts to do something good for the environment and give the neighborhood association a chance to “earn” $1000? Only you can decide that. In case you are a person who likes to read “primary documents,” here’s the document – an e-mail from MG&E’s Community Services Manager Bob Stoffs – that informed DMNA president Jeff Glazer of the DMNA’s acceptance into the Green Power Tomorrow Neighborhood Challenge. Happy New Year and congratulations! The registration period for MGE’s neighborhood green power challenge is now over and Dunn's Marsh is one of 16 neighborhoods participating in the Madison green power challenge. We are very excited by the strong interest Madison neighborhoods have shown in improving the environment by supporting renewable energy. MGE will be able to calculate the changes in green power participation in your neighborhood after the challenge period is over on September 30, so you won’t have to track who signs up. Basic information and fact sheets about green power are available at http://www.mge.com/greenpower <http://www.mge.com/greenpower> <http://www.mge.com/greenpower <http://www.mge.com/greenpower> > . Your neighbors can enter their address on this same page to find out the cost for buying different levels of green power based on their actual electric use, and also to sign up for the program. In addition, MGE’s Green View renewable energy channel http://www.mge.com/greenview <http://www.mge.com/greenview> <http://www.mge.com/greenview <http://www.mge.com/greenview> > has several video articles about renewable energy, including this one about why supporting green power is important: http://www.storybridge.tv/greenview/askbob5 <http://www.storybridge.tv/greenview/askbob5> <http://www.storybridge.tv/greenview/askbob5 <http://www.storybridge.tv/greenview/askbob5> > . MGE can provide printed fact sheets and sign up cards for your use and distribution. We can also present information and answer questions about green power (and other energy topics) at neighborhood meetings and events. And I would be happy to talk with you to see if MGE can assist with any ideas you have about promoting green power. Snow, cold, slush, brrrr...we're in the middle of a Wisconsin winter and MGE wants to make sure you stay safe. Learn about dryer venting dangers and how not to become a victim of a dryer fire. If you have electric heat, we offer a couple of tips that will help you save this winter. There could be more money in your pocket in 2010 with energy tax credits and cash-back for purchasing energy-efficient appliances and equipment. MGE's Rosiere Wind Farm turns 10. Learn about how it took a whole community to build Wisconsin's first wind farm. Every year, clothes dryer fires cause millions of dollars in property damage and injure hundreds of people. Many of these fires are caused by two things: improper venting material and lint build up. A clothes dryer operates by forcing hot air through clothes in a turning drum. Lint is created from the clothes as they dry. Although much of the lint is trapped in the dryer's filter, it also goes through the venting system. Accumulating lint collects in the dryer and dryer vent, reducing airflow and creating a fire hazard. Clean the lint filter with every load. Replace white plastic vent hose with metallic vent pipe. Clean inside, behind and underneath the dryer where lint can also build up. If you only have one thermostat: Set the temperature lower while you are sleeping or gone. If you have more than one thermostat: Set the temperature lower in unused rooms and close the doors. The bigger the setback, the more you save. However, when deciding how much to set back the temperature, keep in mind how long it will take the room to warm back up. If you made energy improvements or replaced a furnace or air conditioner in 2009, you might be eligible for a tax credit from the IRS. Tax credits are available at 30% of the cost, up to $1500 for products placed into service in 2009. Even if you purchase multiple products, you can only get a maximum of $1500 over the two-year period (2009 & 2010). You need to file the IRS Form 5695 with your 2009 taxes. Focus on Energy has begun offering cash back on new ENERGY STAR® qualified home appliances. The Wisconsin State Energy-Efficient Appliance Rebate Program offers Cash-Back Rewards on high efficiency appliances, water heaters and heating and cooling equipment. Funding is provided by the Department of Energy and is being administered through Focus on Energy. The purpose of this program is to replace and properly recycle old units with new high efficiency ones. Consumers will receive a mail-in Cash-Back Reward application at the time of purchase directly from their retailer or contractor. Rebates will last until February 2012 or until funds are gone. For eligible equipment and rebate amounts, visit: State Energy-Efficient Appliance Rebates. In 1999, MGE's Rosiere wind farm in Kewaunee County was completed but the work actually began over a year before the groundbreaking. Wind energy was totally new. Several landowners were eager to have the giant wind turbines as neighbors but some were not. See how the residents of Lincoln and Red River worked with MGE to make the first wind farm in Wisconsin a reality. When 10-year-old Tyrickus Echols died in December, hearts of people in the neighborhood went out to the family. The Dunn’s Marsh Neighborhood Association set up a way for people to express their sympathy. As a result neighbors sent over $200 in donations to the DMNA to be used for the Echols Family. Social Committee convener Sheila Handrick will be getting Woodman’s gift certificates for the family. Did you miss the deadline for making donations but still really want to contribute? Contact Sheila at <sm_hand@yahoo.com> for details on how to do so. Maxx of 13 years died from heart and lung issues. It was a very sad day for all. Stephan who does not even like dogs got attached to Maxx. He was a great schnauzer. He liked everyone, and many people got a dog after meeting and spending time with him. I had children that came here scared of dogs and left loving dogs, and parents were really happy that they learned with Maxx. He had a lot of friends that loved him. It truly was amazing what gifts this little dog gave to so many. I was surprised of the funny stories that were told of him as a pup in the neighborhood. See, Maxx was a dog who loved his house but if he had a chance to be off his lead he was gone. One late March that happened. I could not find him. The evening came, and around 6:00 pm I get a call from a neighbor 3 or 4 blocks away. He had come home from work and found Maxx lying on his lazy-boy in the front room with his 2 big! cats. Maxx had eaten all the cat food and decided to take a nap. He had come in the cat door with the cats and couldn't figure out how to go back out. Well, Dan (now a neighbor friend) fell in love with Maxx and would over the years to follow come and walk him in the park on his days off. It would be good for Maxx and him. One neighbor reminded me of a call we received late one evening around 11:00 asking us do we know where our kids are. I said “Yes!” and then on the other end laughing, “But do you know were your dog is?” That is how Maxx became friends with Sue and Gerald on Windflower Way. Well, the stories went on and on here for about a week as each neighbor had their own story to tell about this loveable 17-pound Schnauzer that stole even a cat lover’s heart. He didn't drag a child from a burning building but he was our Hero of animal kindness. Now that I have your attention, let me suggest clicking on the attachment referenced above. To be honest, it doesn’t show the beavers, but I can report that there seems to be a beaver trail, at least one very tall beaver lodge on the east end of Dunn’s Marsh, and of course the many trees gnawed off by the beavers this fall. 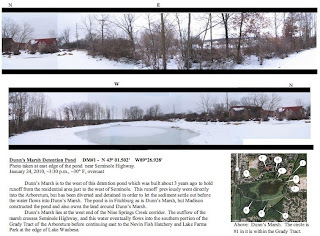 What the attachment does show is a 360º photo collage taken from the edge of the Dunn’s Marsh detention pond which is nestled below the future Cannonball Trail and just west of Seminole Highway at the southern edge of our neighborhood. This photo is just the miniscule beginning of a pretty ambitious project to document Dunn’s Marsh now. Not only will it be a record of the present but a primary source to compare to years hence when someone might do this again. The photo attachment is part of a project called the Arboretum Corps of Discovery. This fall over 40 volunteers took an intensive 4-day class aimed at improving photographic, writing, and drawing/painting skills. The Arboretum asked these volunteers to choose areas of the Arboretum to document through a series of 360º photos from predetermined points. “Our” part of the Arboretum just to the east of Seminole Highway, also known as the Grady Tract, is included. In addition, Corps members will also apply their writing and art skills to subjects of their own choosing within their areas. The goal is to “communicate nature” so that people can better appreciate it. Appreciation is a necessary precursor to wanting to protect it. Besides choosing 2 areas in the Grady Tract, I chose to also do the area around Dunn’s Marsh. Why? Because it’s my neighborhood, first of all, but also because big changes are in the offing. Two we know of are the Cannonball Trail which will stretch both west and east along the marsh and the construction of yet another wet pond at the foot of Apache Drive. When you look at the attachment, you’ll not only see the Dunn’s Marsh detention pond but also small map of the additional photo points I’ll be documenting throughout the coming year - 12 in all. Since I may have bitten off more than I can chew, I would welcome any other interested neighbors to join me in this project. My contact information is in the masthead of the e-News. All is serene and quiet in the snow-covered surroundings of the Dunn’s Marsh detention pond now. Winter or summer, it’s a good place to go if you want to forget the cares and worries of urban life. As to what beavers do in the winter, here’s the answer. Families of parents, last year’s kids, and eventually a new set of kits, born in the spring, are snug in their lodge which has an underwater entrance. They will be in the dry upper part of the lodge feasting on the bark of branches they have cached underneath the water and have brought up for a tasty meal. Camp Pawprint is a series of week-long day camps held at Dane County Humane Society during the summer. Campers ages 7 to 15 enjoy animal-related lessons and activities while having fun with other animal lovers! Activities include humane education lessons, critter projects, group games, and daily presentations from local animal experts. All campers spend time interacting with our camp animals and getting hands-on experience providing daily care and socialization. Animals used in the camp program vary daily and are approved by our behavior department. Registration opens February 1. Spots are limited and fill quickly so don't forget to register early! Some scholarships are available. For more information on Camp Pawprint including dates, themes, and fees, go to http://www.giveshelter.org/sitemgr/camp_pawprint <http://www.giveshelter.org/sitemgr/camp_pawprint> . MADISON – On January 21, Governor Jim Doyle unveiled a new self-funded health care plan today for adults without dependent children who are on the state health care waiting list. BadgerCare Plus Basic will provide enrollees with limited access to physicians, hospital services, generic prescriptions and catastrophic coverage, and will be paid for entirely through a monthly premium of $130. The Basic plan is not designed to be a long term health coverage plan, but instead will be a bridge plan to keep individuals healthy while they wait for space in the BadgerCare Plus Core Plan. More than 64,000 individuals have enrolled in the state's BadgerCare Plus Core Plan, which suspended new enrollments in mid-October due to budget limits. Since that time, more than 20,000 individuals are on a waitlist for the program. The BadgerCare Plus Core Plan provides standard health benefits for low income adults without dependent children. and Badger Rx Gold discount drug membership. To be eligible for coverage, individuals must have incomes below 200 percent of the federal poverty level, have no dependent children, and be included on the waiting list for the BadgerCare Plus Core Plan. To find out more about the Core Plan or to apply for the waitlist, please visit: www.badgercareplus.org. • Never leave your car engine running or the keys in the ignition. • Always lock your vehicle, even in front of your house. • Never leave valuables in plain view. Lock in the trunk. • Remove expensive items and electronics from your vehicle when you park. • Park in a busy well lighted area. • Approach your vehicle with keys in hand; look around before you open the door. • Look inside your vehicle before you get in. • When driving, keep your doors locked. more important than any vehicle. • If your vehicle has a security system, use it. • If your vehicle is stolen, contact the local police immediately. Budget: After a long budget with very little positive options, the county board voted to continue services and increase property taxes by approximately $20 per household. We approved a 3% pay reduction for all county employees to avoid any layoffs. As a county supervisor, I am an employee, and I too took a 3% cut. (I voted for an amendment to reduce county supervisor pay by more than 3%, but it did not pass.) My amendments to freeze capitol spending until committee approval, to use federal funds to increase public safety and courthouse staff, and to fund a weekend juvenile court program, passed. Dane County Task Force on Poverty: The task force issued its final report in November. Poverty is on the steep rise—For 2008: Food pantry usage is up 20%; food stamps recipients is up 50%; 47% of Madison school children receive free or reduced lunch; 7,000 individuals sough housing shelter (95% were individuals in families). I am a cosponsor of a resolution to make the task force a permanent county committee, so it can continue to monitor poverty in Dane County. Property Rights: The Realtors Association mailed out a postcard to many county residents about property rights and the draft Shorland and Riparian Management Report. This postcard, I am sorry to say, is filled with many errors. To clear up the confusion, there is NO proposal before the county board to address property rights. There is no vote coming up, and nothing is in the works to be proposed in 2010. The state of Wisconsin is requiring all counties to review their Shoreland laws, and thus county staff is working on such review, which they say will take a year or two to complete. Unlike what the postcard said, no property values will be impacted. No one will be required to get permission to add a deck to their house, or change the color or size of their house. And, most importantly, the proposed changes will only apply to towns, not cities or villages: No home in Madison will be impacted. Reducing Infant Mortality: A front-page New York Times article on November 27th featured our success in reducing infant mortality among African Americans. The story highlighted the county’s work to provide pregnant women with prenatal care and other health services, along with pregnancy education and moral support. The results are astounding: the African American infant mortality rate in Dane County dropped from 19 deaths per 1,000 births in the 1990s to less than 5 deaths per 1,000 births in the 2000s. This decline brings the African American infant mortality rate in parity with the white infant mortality rate. Attendance: There were several all-night county board meetings in October and November, and a local talk radio host accused me of missing these meetings. I want to set the record straight-- I did indeed attend those county board meetings in their entirety and I did not miss a single vote. I was off the county board floor for portions of the meetings because I was in the media room pumping milk for my 4-month-old daughter. All testimony is piped into the media room, so I was able to hear everything that was going on, and I was not gone from the board floor for more than 20 minutes. With a newborn child, I am not able to attend 5 hour meetings without taking a 20 minute break to pump. But please be assured that I am indeed at all meetings. I take this job very seriously and am honored to serve. Vote: The primary spring election is Tuesday February 16th, and the general election is Tuesday April 6th. Please vote! As always, please contact me with any thoughts or questions. You can reach me at bayrd@co.dane.wi.us, or by phone 442-6294 (home) and 658-7333 (cell). In this age of instant communications, we are working to expand the ways we stay connected with people throughout our state. We strive to give every phone call, e-mail, and hand written letter the same level of careful consideration. As your Senator, it’s both helpful and necessary to hear your thoughts on federal legislation, and provide updates on what is happening in Congress. We are always looking for new ways to be in touch so that I can do my job most effectively. Website: A useful way to stay in touch is through my website, kohl.senate.gov. It includes everything from my views on issues of the day to updates on what is happening in Congress. You can write to me at http://kohl.senate.gov/contact.cfm. Letters: If you are a Wisconsin resident and wish to share your comments and concerns regarding any issue, there are additional options. You can contact me through my website or you can mail your correspondence to the address below and I will be sure to respond to your concern. (Due to security measures instituted after the anthrax attack in the Hart Senate Office Building, mail is diverted to an off-site facility before being delivered to our offices; please note that this can result in a delay of up to several weeks). Phone Contact: While I try to provide as much information on the major issues as possible through the use of my website, people often prefer to make direct contact for additional information or to voice their opinions on particular subjects. That’s why we maintain a toll-free number that I encourage constituents to call: 1-800-247-5645. Facebook & YouTube: Last year I set up my own Facebook and YouTube pages. These forms of social media allow you to see streaming video of speeches and events and stay up to date with what I’m working on in Wisconsin and Washington. You can “friend” me on Facebook or access my YouTube account at http://www.youtube.com/SenatorKohl. Office Hours: When the Senate is in session and I can’t be in Wisconsin, we offer office hours with my regional representatives in communities across Wisconsin. My representatives are on hand to assist you with any case work or specific questions you may have. Information on upcoming office hours in your community can be found on the front page of my website and are listed by region. Constituent Breakfast: Shortly after taking office, I began hosting a weekly constituent breakfast for Wisconsinites visiting Washington DC. The breakfasts take place every Wednesday when the Senate is in session, beginning at 9 a.m. Please come and chat with me and my staff, have some coffee and donuts, and snap some pictures. If you are coming to Washington for business or pleasure, please call ahead to let me know you'll be here. All groups are welcome at the breakfast. As the senior Senator from Wisconsin, I’m fortunate to represent a state with a rich, progressive history and diverse thoughts and opinions. Like with family and friends, we may not be of the same mind on every issue, but no doubt there are many on which we will agree. It’s important to me that you can trust you will be heard. Volunteering opportunities at HospiceCare include working with patients, helping with special events, providing assistance with office work, helping in our gardens or kitchen and more. Learn how you can help and why volunteers are so valuable at HospiceCare’s next question-and-answer seminar, “The Heart of Volunteering.” The free, public seminar will take place on Tuesday, February 9, 6:30 p.m. – 8:00 p.m. at the Don & Marilyn Anderson HospiceCare Center, 5395 E. Cheryl Parkway in Madison. Pre-registration is requested; please call Carrie Glantz, HospiceCare public affairs, at (608) 327-7202. In February, HospiceCare Inc. will offer two recurring support groups for those grieving the death of a loved one, host an informational discussion group for caregivers and begin a caregiver support series. All groups are open to the public and free of charge. All groups require pre-registration and are held at the Don & Marilyn Anderson HospiceCare Center, 5395 E. Cheryl Parkway, Madison, unless otherwise noted. Bridges Weekly Support Group is held every Wednesday, from 9:30 a.m. – 11:00 a.m. This open-ended, weekly group is for adults who have suffered a loss due to death. Pre-registration is not required. Young Widows Group is held the first Thursday of every month, from 7:00 p.m. – 9:00 p.m., at San Damiano’s, 4123 Monona Drive in Madison. This monthly group is for women under the age of 50 who have experienced the loss of their spouse/partner due to death. This group is held in collaboration with The Center for Life and Loss Integration and Gunderson Funeral Home. After the Caregiving Ends will be held Wednesdays, February 17 – March 10, from 4:00 p.m. – 6:00 p.m. This four-week interactive series is to help caregivers cope with and adjust to their changing role after the death of their care recipient. Conducting Family Meetings will be held February 16, from 6:30 p.m. – 8:00 p.m. This seminar is for those caring for someone with a progressive or terminal illness. This session will offer guidelines for conducting effective family meetings that can be used to help decide how to share caregiving responsibilities and for making caregiving decisions. To register for any of these groups, call HospiceCare at (608) 276-4660 and ask to speak with a grief counselor.